When the market officially entered a correction a few weeks ago, many analysts suggested a severe bear market was ahead — or something even worse. Some are comparing now to 1987 — 28 years ago — when, on Oct. 19, the stock market fell 22% in one day. It turned out to be my 40th birthday, but few of my investment friends were celebrating. However, my subscribers were happy. Six weeks earlier, I had warned them that a crash was possible. Today, the doomsayers are making similar warnings. “Dollar Collapse Inevitable by Fall of 2015,” warns former Congressman Ron Paul. Bert Dohmen said, “Batten down the hatches!” Even Goldman Sachs is predicting sharply lower corporate earnings and $20 a barrel oil. Last weekend, I met with Donald Trump again, and he hasn’t changed his message — the American dream is over. But that’s not my view on the stock market. Anything is possible, but more than likely we are witnessing a replay of 2011 rather than 1987. In 2011, the market was relatively flat. It fell sharply during the summer due to global credit anxieties but then rallied in the fall. Certainly the Fed’s zero-interest-rate policy and its rapid expansion of the money supply suggest a Santa Claus rally more than a collapse. Today, we enjoy rock-bottom interest rates, negligible inflation, an improving economy, rebounding home prices, a strong dollar and sharply lower energy prices. What has happened in the past three weeks? The Dow is roughly 1,000 points higher. It just goes to show you that “bears make headlines, bulls make money.” And we are taking full advantage with Forecasts & Strategies. Lots of prisoners get released early, or, if terminally ill, are let out to be with their families when they die. But not Irwin Schiff, the tax protestor who died last week at the age of 87. His son, Peter Schiff, CEO of Euro Pacific Capital and a well-known financial advisor and author, wrote his father was a “political prisoner” who passed away on October 16, 2015, at the age of 87, while legally blind and shackled to a hospital bed in a guarded intensive-care room. But the free nation he was born into had already “died years earlier,” the son added. What was Schiff’s crime? For years, starting in the early 1980s, he had urged citizens to stop paying taxes and to file federal and state tax returns claiming that they earned no taxable income because their dollars weren’t backed by Constitutional money (gold or silver). He also argued that the 16th Amendment was never properly passed and, therefore, was not enforceable. He wrote a “how to” bestseller called “How Anyone Can Stop Paying Income Taxes” and gave thousands of seminars showing people how to file these “no tax” returns. Unfortunately, Irwin Schiff’s book should have been called “How Anyone Can Go to Jail.” No matter how valid his arguments were, no federal or state judge was going to admit they were right. They dismissed them because to support Schiff’s cause would mean the end of their own salaries. Schiff’s extremist views went counter to the vested interests of the establishment. As a result, thousands of tax protestors went to jail, an unexpected consequence of Schiff’s tactics. And for that, he must be held accountable. To read Peter Schiff’s tribute to his father, go here: http://www.schiffradio.com/death-of-a-patriot/. I encourage you to read the New York Times’ obituary about Irwin Schiff. Special Announcement: Subscribers to Skousen CAFE will be happy to know that for the first time in two years, I am hosting the Global Financial Summit, a special private investment seminar, in the Bahamas. The focus will be on “High Income & Fast Money Investing” — combining my two most successful trading services! My “All Star High Income & Fast Money” experts for this exclusive private meeting will include Alex Green, investment director of the Oxford Club and editor of three trading services (Momentum Alert, Insider Trader and True Value Alert). Alex is rated the #5 best investor according to Hulbert Financial Digest. I’ve also confirmed Martin Truax, vice president at Raymond James, whose “income & growth” portfolio has more than tripled over the past 10 years. He and his partner Ron Miller have also developed a highly successful trading system using “red” and “green” signals to determine when to get in and out of markets (they flashed “sell” in May and now are flashing “buy” — good calls!). I soon will be announcing more top experts in portfolio management, tax and estate planning and foreign investing. But I want to encourage you to sign up now and take advantage of our special “early bird” discount — $200 off the retail price for Skousen CAFE subscribers if you register by Dec. 31. The price is only $495 per person/$795 per couple with the discount. And hotel rates at the five-star Atlantis Resort are only $209 per night. We are limiting this private meeting to 200 attendees only. For more information, go to http://freedomfest.com/blog/2015/02/16/global-financial-summit-2016/, and to sign up, call Valerie at 1-855-850-3733. 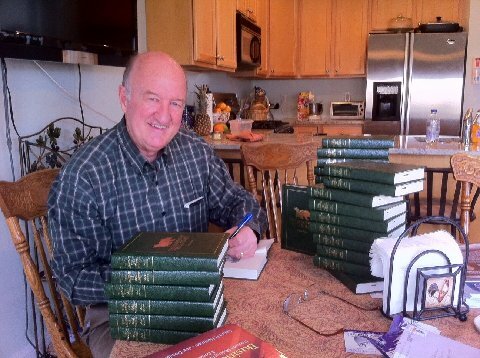 Would You Like a Special Autographed Edition of ‘Maxims of Wall Street’ Dated Oct. 19? In celebration of the anniversary date of Oct. 19 (stock market crash and my birthday), I’m offering a special 4th edition of “Maxims of Wall Street” to my subscribers. If you order copies this week, I’ll autograph each copy and include the date, October 19, 2015. You pay only $20 for the first copy, and all additional copies are only $10 each. All will be personally autographed, dated October 19, 2015, and mailed to you for free (I pay the postage). I’m offering “half off” because I know “Maxims” makes a great gift for friends, relatives, business colleagues, investors, your favorite stockbroker and money manager. Many people order a whole box (32 copies). The price of a box of books is only $300 postpaid. To order your copies at this super discount, call Ensign Publishing, toll-free: 1-866-254-2057, or go to www.miracleofamerica.com/maxims. In case you missed it, I encourage you to read my e-letter column from last week about my meeting with David Rockefeller and how to hang onto your wealth. I also invite you to comment in the space provided below. Market analyst Chris Versace describes the benefits and growth of the exchange-traded fund investment industry.